Our home is available for photo and video shoots. We'd love to have you here and fall in love with our home as much as we have. We've spent the last 7 years extensively transforming our home and are opening our doors to individuals and brands for photo and video shoots. Please see below for rates. olliePop Design is committed to helping small women-owned businesses thrive. If this is you, contact us directly as we offer special rates when it makes sense for both you, and us. Current rates reflect that a few items are not yet complete. *This is the average rate. We put custom rates together for each shoot depending on it's size/complexity and how many prep days or time is required. I was a producer for years so understand that some shoots are very small and quick while others require a lot of scouting and pre-shoot time. We want this to be a good fit for everyone so will adjust the rates up or down depending on the situation. The main living space is all open and includes a kitchen, dining room, entry and large open pantry area. The master bedroom and bathroom both feature a wall of reclaimed street paver bricks that were milled into flooring. Some of which include the original street names carved into the brick. 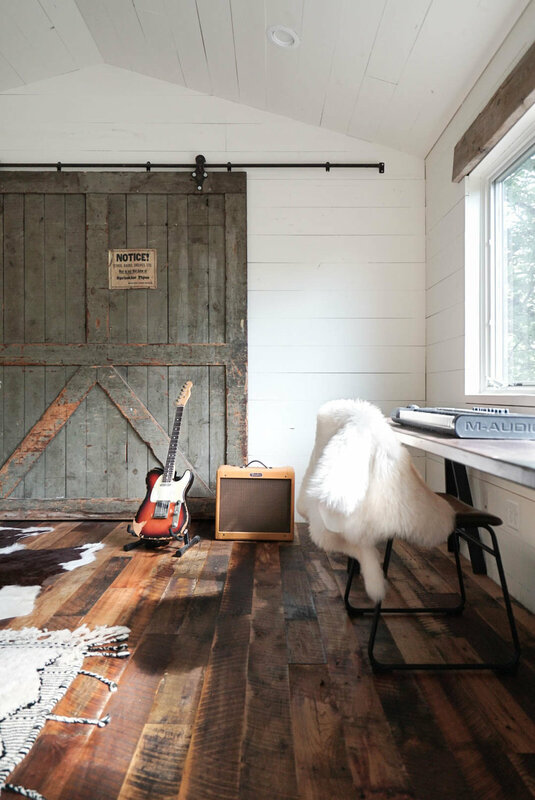 In the bedroom, the headers above the windows are reclaimed wood and the same reclaimed wood flooring that's on the main level runs throughout this room. The bathroom features a large wet area where half the bathroom is behind a glass of wall and houses a dual shower and large jacuzzi tub. We used vintage faucets and a tub filler, and the shower is covered in Carrara marble. The vanity is custom made and features reclaimed hotel moulding and a custom mantel. The office features a 20' long desk facing a full wall of windows, a seating area with couch and coffee table, a seating area with a table and 2 chairs and a large original factory door on the back wall (hides a closet). The same reclaimed wood floor runs in here and the window features a reclaimed wood header. 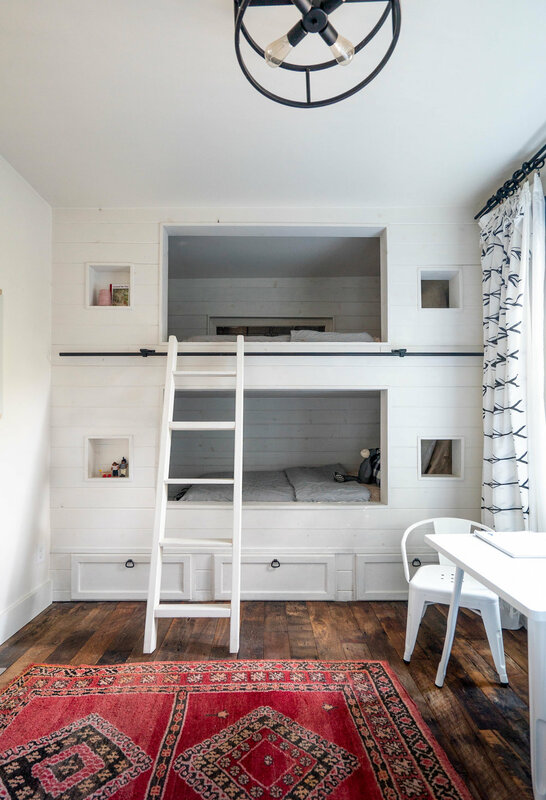 There are custom build-in bunk beds including a white ladder. This floor includes 2 children's rooms, a landing area and small half bath. 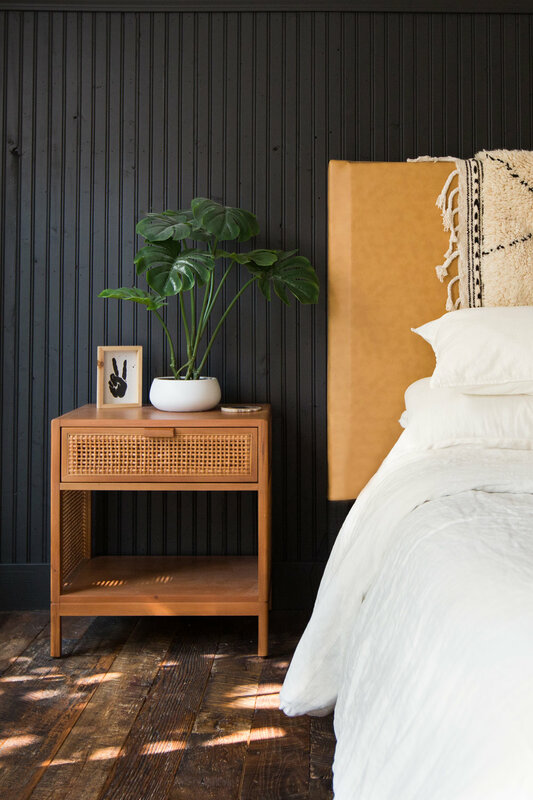 It features 12" wide reclaimed wood flooring with the original finish, angled ceilings with white boards on the walls/ceiling, fun exposed closets and a feature wall with owl wallpaper. All light fixtures are handmade unpolished brass. Select the spaces you're interested in booking. Enter the preferred shoot date. We won't hold you to this date, it just gives us a general idea as to when you'd like to reserve the space.